As concerns regarding indoor air quality increase, there is increasing concern with respect to mold. Used properly, a thermal imager can help identify areas of potential mold growth. Mold is a ubiquitous single cell organism that tends to favor moist environments. Of the thousand species of mold found worldwide, many are harmless; however, certain species are toxic. Others can cause chronic health problems in humans. Evidence of moisture can only be detected if a temperature differential exists across the surface of the material being inspected. Frequently, a delta T can be created by actively heating or cooling a structure or by relying on solar loading of the subject areas. Subject building components should be imaged from both indoor and outdoor aspects under the correct weather conditions. Suspected moisture presence must be confirmed by independent means. A negative finding for latent moisture does not guarantee that mold is not present. Since moisture presence is not positive proof of mold presence, further laboratory tests will be required to confirm mold within any moist areas detected. Using thermal imaging to detect latent moisture within buildings is one of the many topics covered in all Infraspection Institute Level I training courses. For more information on thermographer training or to obtain a copy of the Standard for Infrared Inspection of Building Envelopes, visit Infraspection Institute or call us at 609-239-4788. Thermography can be a valuable tool for testing and monitoring in-service motors. It can also be a useful tool for detecting hidden problems within motors that are being rebuilt. Electric motors are a vital component in most industrial facilities. In the event of catastrophic failure, facility managers often elect to rebuild large or special motors. In order to maximize the service life of a remanufactured motor, it is imperative to diagnose and correct faults during the rebuilding process since unresolved defects may shorten the life of a rebuilt motor. For motor testing, infrared imaging may be conducted by staff thermographers employed by a motor shop or an experienced third party working at the shop. During the rebuilding process, infrared imaging may be used to diagnose problems on incoming motors and to perform quality assurance checks during the rebuilding process. Upon arrival at the repair facility, a motor is disassembled and the rotor and stator are stripped of their coils. A high current test set is then used to excite the subject components. During excitation a thermal imager is utilized to identify thermal anomalies that are the result of short circuits and/or faulty wiring. These areas are marked so that technicians can make appropriate repairs. Thermogram shows hot spots (white) in motor stator due to shorted laminations. Once the cause of thermal anomalies has been corrected, the rebuilding process will continue. Thermal imaging can be applied incrementally during the rebuilding process to help detect improper wiring or loose connections. Infrared inspection of electric motors is one of the many topics covered in the Level I Infraspection Institute Certified Infrared Thermographer® training course. For more information or course locations and dates, call 609-239-4788 or visit us online at www.infraspection.com. Batteries are the lifeblood of portable electronics and thermal imagers are no exception. Understanding how to properly handle and care for modern batteries can prolong their life and prevent damage. Most thermographers give little thought to equipment batteries until they go dead or fail. Without power, even the most sophisticated thermal imagers are useless. As thermal imagers have evolved, manufacturers have moved to take advantage of advancements in battery technology with many units now powered by Lithium-ion batteries. Li-ion batteries offer several advantages over traditional batteries of the lead acid, nickel cadmium, or nickel metal hydride types. Primary advantages of Li-ion batteries are excellent energy-to-weight ratios, no memory effect, and a slow loss of charge when not in use. Lastly, avoid keeping or charging batteries in hot environments such as the closed interior of an automobile during the summer months. Many Li-ion battery packs contain protective circuits to guard against an over temperature condition. Should a battery become too hot, its protective circuit will open rendering the battery useless. Care and usage of infrared test equipment is one of the many topics covered in the Infraspection Institute Level I Certified Infrared Thermographer® training course. For more information including course locations and dates, visit www.infraspection.com or call 609-239-4788. The Infraspection Institute Standard for Measuring and Compensating for Transmittance of an Attenuating Medium Using Infrared Imaging Radiometers provides procedures for calculating window transmittance which is critical to accurate temperature measurement. To obtain a current copy of the Standard, call 609-239-4788 or visit the Standards area of our online store. Almost all handheld thermal imagers come equipped with neckstraps as standard equipment. If you utilize the neckstrap supplied with your imager to support or carry your imager, the following tips can help to avoid costly damage caused by an unexpected drop. 1) Many neckstraps are made of relatively thin material. Retrofit thin neckstraps with sturdier material. 2) Check your neckstrap frequently for wear. Neckstraps frequently become frayed where they attach to camera body eyes or snap hardware. 3) Be certain that your neckstrap ends are permanently sewn so that they cannot be pulled apart or separate accidentally. 4) Check snap swivels for condition. Replace worn or inferior hardware with quality materials. 5) Consider adding a second, redundant neckstrap in case the primary neckstrap fails. 6) Periodically check camera body eyes for wear and mechanical integrity. Over time, attachment points that mate with metal hardware can erode; mechanically fastened hardware on your imager can become loose. Following the above tips can help prevent accidentally dropping your imager and could save you from a costly repair. Proper use of infrared imagers is one of the many topics covered in the Level I Infraspection Institute Certified Infrared Thermographer® training course. For information on open enrollment classes or our Distance Learning program, visit us online or call us at 609-239-4788. 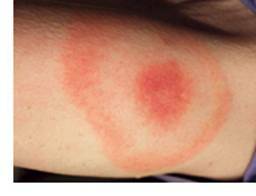 Photo showing ‘bullseye’ rash typical of Lyme Disease. The easiest way for a doctor to diagnose Lyme disease is to see the unique bull’s-eye rash. If there is no visible rash (as is the case in about one-fourth of those infected), the doctor might order a blood test three to four weeks after the onset of the suspected infection to look for antibodies against the bacteria. In its early stages, Lyme disease can be effectively treated with oral antibiotics. In general, the sooner such therapy is begun following infection, the quicker and more complete the recovery. For advanced cases, intravenous antibiotics may be necessary. Essential to prevention is the avoidance of deer ticks. Although generally only about one percent of all deer ticks are infected with the Lyme disease bacterium, in some areas more than half of them harbor the microbe. Deer ticks are most often found in wooded areas and nearby grasslands, and are especially common where the two areas merge. 2. Wear your shirt tucked into your pants, and your pants tucked into your socks or boots. 3. Apply tick repellents with DEET to your clothing, shoes and socks before going out. 4. Check yourself, family, and your pets routinely for ticks, especially after a trip outdoors. 5. Shower and shampoo your hair if you think you may have been exposed to ticks. 6. Check your clothes for ticks and wash them immediately in order to remove any ticks. Be sure your imager is steady as you capture the image. Gently push the store button rather than punching it. If using a handheld imager, consider using a tripod or monopod to help stabilize your imager. Infrared imager operation is one of the many topics covered in the Infraspection Institute Level I Certified Infrared Thermographer® training course. For more information or to register for a course visit us online at www.infraspection.com or call us at 609-239-4788. For transformers with separate tanks for each phase, compare phase tanks to each other. Transformers with balanced loads should exhibit similar temperatures between tanks. Qualitatively inspect radiator sections. Radiator tubes should be uniform in temperature and, in most cases, should operate above ambient temperature. Compare transformer operating temperature to nameplate rating. For long term service, transformers should not operate above their maximum rated temperature. Compare tap changer tank to main body of transformer. For properly operating tap changers, tap changer tank should not appear warmer than main body of transformer. In conjunction with the infrared inspection, cooling fans and or pumps should be checked for proper settings and operation. Finally, transformers require proper air circulation for cooling. To help ensure maximum airflow, transformer radiators should be unobstructed and free from dirt and debris. Infrared inspections of electrical distribution systems is one of the many topics covered in the Level I Infraspection Institute Certified Infrared Thermographer® training course. For information on thermographer training or to obtain a copy of the Standard for Infrared Inspection of Electrical Systems & Rotating Equipment, visit us online at www.infraspection.com or call us at 609-239-4788, Skype 609-239-4788. Data obtained during infrared inspections can often be improved by incorporating other tools. When it comes to building inspections, a blower door can be useful in detecting air leakage sites and helping to gauge the airtightness of a building. Air leakage is often a major source of energy loss in buildings. Although an infrared imager can help detect evidence of air leakage sites, it cannot pinpoint all air leakage sites nor can it quantify the amount of air leakage occurring. Many thermographers overcome these limitations by utilizing a blower door in conjunction with their infrared inspection. A blower door consists of an instrumented, high volume fan that is temporarily placed in a doorway to create a positive or negative pressure within a building. In depressurized mode, the blower door simulates a wind blowing equally on all sides of the building. Conducting an infrared inspection with the building depressurized enables a thermographer to detect air leakage sites that would not be visible under natural conditions. With special software, it is possible to estimate the relative leakage of a structure as well as the total area of all leak sites. A blower door can provide a thermographer with some advantages; however, there are challenges associated with their use. Using a blower door during an infrared inspection represents a “worst case” scenario and may not be indicative of natural conditions. This may invalidate thermal imagery that is destined for use in a legal case. Since blower doors can cause backdrafts from fireplaces, stoves, and heating equipment, they should be operated only by persons who are properly trained in their application and use. Infrared inspection of building envelopes is one of the many topics covered in the Infraspection Institute Level I Certified Infrared Thermographer® training course. For more information or to register for a course, visit Infraspection Institute or call us at 609-239-4788. Thermographically detecting air leakage sites within buildings is dependent upon proper site and weather conditions and imaging vantage point. Determining the location of a building’s neutral plane is key to ascertaining the correct vantage point for thermal imaging. Air leakage can account for significant energy losses within buildings. Such losses occur as unconditioned air moves through the building’s thermal envelope into conditioned spaces. For heated low-rise structures, air typically infiltrates at lower elevations and exfiltrates at higher elevations. Simply defined, the neutral plane is the elevation within the structure where no air leakage occurs since indoor/outdoor air pressure is balanced. Determining neutral plane location can often be more art than science. Among the many factors that influence the location of the neutral plane are: building construction, building height, inside/outside temperature differential, and the operation of the building’s HVAC system. Wind speed and direction can also influence the location of a neutral plane. To help determine the location of a building’s neutral plane, use your thermal imager to investigate likely air leakage sites such as electrical receptacles on exterior walls. If you detect evidence of air infiltration at these sites, move upward to the next floor of the structure. Once above the neutral plane, evidence of air leakage sites will generally not be thermographically detectable unless a negative pressure is created with a blower door or the building’s HVAC system. Infraspection Institute has been training and certifying infrared thermographers worldwide since 1980. Infrared inspection of building envelopes is covered in depth in all of our Level I training courses. For more information on our Certified Infrared Thermographer® or Distance Learning courses, call us at 609-239-4788 or visit www.infraspection.com. Solar-driven infrared inspections of insulated structures and roofs must be performed when sufficient Delta T is present. Knowing how to gauge when this window of opportunity is present is critical to the accurate collection of data. Infrared inspections of structures often utilize solar loading to create temperature differentials necessary for the inspection. Common applications include moisture inspections of roofs and walls, structural inspections of CMU walls, and gauging product levels in tanks and silos. Often, these types of infrared inspections are performed during evening hours following a sunny day while the structure is cooling. The time frame during which solar-driven infrared inspections may be accurately performed is often referred to as the ‘scanning window’. The scanning window is said to be open when conditions permit the collection of accurate data. A number of interdependent factors will determine when the scanning window opens and closes. These include, but are not limited to: target construction, amount of solar loading, local weather conditions, and imager sensitivity. To determine when the scanning window opens, a thermographer should initially isolate an area with a small delta T indicative of an exception. For moisture inspections, this might be an area that is confirmed to be minimally wet. Using this area as a benchmark, the thermographer can periodically re-check this area during the inspection to determine if a Delta T remains. In general, the disappearance of a Delta T in the benchmark area will indicate that the scanning window is closing. Infrared inspections of building envelopes and roofs are two of the many topics covered in the Infraspection Institute Level I Certified Infrared Thermographer® training course. For more information on other course offerings, call 609-239-4788 or visit us online at Infraspection.com. The impact of convection on non-contact temperature measurements is just one of the many topics covered in all Infraspection Institute Level II Certified Infrared Thermographer® training courses . For more information on open enrollment classes or our Distance Learning opportunities, call 609-239-4788 or visit us online at www.infraspection.com. What is the financial liability of a hotspot within an electrical system? Probably less than you think since electrical hotspots waste surprisingly little energy even when operating at high temperatures. Over time, many have stated that the cost of infrared inspections can be justified through the detection and subsequent repair of hotspots associated with loose/deteriorated electrical connections. Although these types of defects can produce temperature rises of hundreds of degrees, the amount of energy wasted in the form of excess heat is often surprisingly small. It is important to note the above illustration is for an extreme hotspot operating undetected 24 hours per day for an entire year. While the above potential savings may seem significant, it would be hard to justify the expense of an infrared inspection program based upon energy savings alone. Justification would be even harder if the dissipated energy were only a few watts. The real value of information obtained from infrared inspections comes from reducing unscheduled downtime, increasing reliability, improving safety, and avoiding losses associated with catastrophic failure. Thermogram shows cool spots caused by delaminated stucco on building facade. 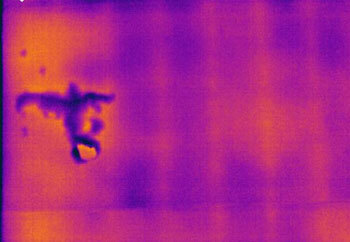 Thermogram taken from building exterior during early evening following a sunny day. Infrared inspection of building envelopes is one of the many topics covered in all Infraspection Institute Level I training courses. For a class schedule or to register for a Distance Learning course , visit Infraspection Institute online or call us at 609-239-4788. With year-end in sight, many will begin the annual process of clearing out files and getting ready for the upcoming year. In this week’s Tip, we share some thoughts on files that you may wish to keep. Recently, while cleaning out some old personal files, my family came across a classic Christmas poem that had been transcribed by my grandmother many years ago. The poem titled, “Jest ‘Fore Christmas” is a 19th century Eugene Field poem that recalls simpler times. The poem’s central character is a boy named William. It is likely that this particular work had caught my grandmother’s attention since her husband and oldest son were both named William. Now as we read the yellowed and fragile notepaper that bears our grandmother’s distinctive handwriting, we can recall many fond memories of her and our family, especially during Christmas. With the holidays and busy year end schedules upon us once again, we invite you to take the time to make special memories with family and friends and to file them in your heart so that you may easily find them in the future. As we enjoy this holiday season, we extend a heartfelt Thank You to all of our readers, friends, and associates throughout the world for everything that you do for us all year long. May your holidays be filled with peace and joy and your New Year with good health and happiness. Father calls me William, sister calls me Will,Mother calls me Willie, but the fellers call me Bill!Mighty glad I ain’t a girl—ruther be a boy,Without them sashes, curls, an’ things that ‘s worn by Fauntleroy!Love to chawnk green apples an’ go swimmin’ in the lake—Hate to take the castor-ile they give for bellyache!’Most all the time, the whole year round, there ain’t no flies on me, But jest ‘fore Christmas I ‘m as good as I kin be! Got a yeller dog named Sport, sick him on the cat;First thing she knows she doesn’t know where she is at! Got a clipper sled, an’ when us kids goes out to slide,’Long comes the grocery cart, an’ we all hook a ride! But sometimes when the grocery man is worrited an’ cross,He reaches at us with his whip, an’ larrups up his hoss, An’ then I laff an’ holler, “Oh, ye never teched me!” But jest ‘fore Christmas I ‘m as good as I kin be! Gran’ma says she hopes that when I git to be a man, I ‘ll be a missionarer like her oldest brother, Dan, As was et up by the cannibuls that lives in Ceylon’s Isle, Where every prospeck pleases, an’ only man is vile! But gran’ma she has never been to see a Wild West show, Nor read the Life of Daniel Boone, or else I guess she ‘d know That Buff’lo Bill an’ cowboys is good enough for me! Excep’ jest ‘fore Christmas, when I ‘m good as I kin be! And then old Sport he hangs around, so solemnlike an’ still, His eyes they seem a-sayin’: “What’s the matter, little Bill?” The old cat sneaks down off her perch an’ wonders what’s become Of them two enemies of hern that used to make things hum! But I am so perlite an’ tend so earnestly to biz, That mother says to father: “How improved our Willie is!” But father, havin’ been a boy hisself, suspicions me When, jest ‘fore Christmas, I ‘m as good as I kin be! For Christmas, with its lots an’ lots of candies, cakes, an’ toys, Was made, they say, for proper kids an’ not for naughty boys; So wash yer face an’ bresh yer hair, an’ mind yer p’s and q’s, An’ don’t bust out yer pantaloons, and don’t wear out yer shoes; Say “Yessum” to the ladies, and “Yessur” to the men, An’ when they ‘s company, don’t pass yer plate for pie again; But, thinkin’ of the things yer ‘d like to see upon that tree, Jest ‘fore Christmas be as good as yer kin be!